Almost 2 years ago to this very day, I found out that I was going to become a mother for the very first time. My heart was instantly overwhelmed with joy and excitement, but it wasn’t long before reality really started to sink in and a flood of all sorts of emotions started creeping in. I could go from thrilled, to scared, to optimistic, to doubtful about anything or everything in 2 seconds flat! Those pregnancy hormones are really something else, y’all. Although planning for a baby is so much fun, it’s also equally overwhelming. What kind of car seat will we buy? Are these crib sheets the best on the market? What’s the safety rating on this stroller? Will I breast feed or should I consider formula? Should I choose disposable diapers or is cloth a good option? How am I going to pay for all of this? What about child care? What’s the deal with all of this natural and organic stuff? FOR REAL you guys. It seems like the choices and options are never ending! And sometimes parents can really feel the pressure when it comes to making these choices. When it’s all said and done, we all want to do what’s best for our babies. One choice in particular that we made for our daughter has been a source of so much pride and joy for us. I knew before my pregnancy came about that I wanted to cloth diaper my child. I watched my sister cloth diaper her girls and was so intrigued by all of it. I researched cloth diapering for well over a year before a baby became part of our reality, and I’ve learned quite a bit in our journey so far. One thing I’ve learned to be very true is that not all cloth diapers are created equally. There’s so many different styles and fits, and finding the right one to fit your needs can be challenging. When I’m shopping for cloth diapers, I’m looking for high quality materials, affordable pricing and fun prints. I recently stumbled across a fabulous little baby store called Lil’ Eco that sells some of the cutest cloth diapers and baby accessories that I’ve ever seen! Lil’ Eco is owned and operated by a wonderful WAHM that lives in Hawaii who left her teaching job to peruse her dreams and passions while being at home with her children. The Aloha spirit runs rampant through her and her business, and her passion to help make cloth mainstream is undeniable! Most of our cloth diaper “stash” consists of pocket diapers and AI2’s. These are the styles that I prefer most because of their ease of use. Because I follow Lil’ Eco on Instagram, I was recently notified of an awesome sale she was having on her standard pocket diapers. I picked up this really adorable puppy dog print (seen below) and have fallen in love with it. The quality was amazing, the price was perfect, and the cuteness factor was out of this world! 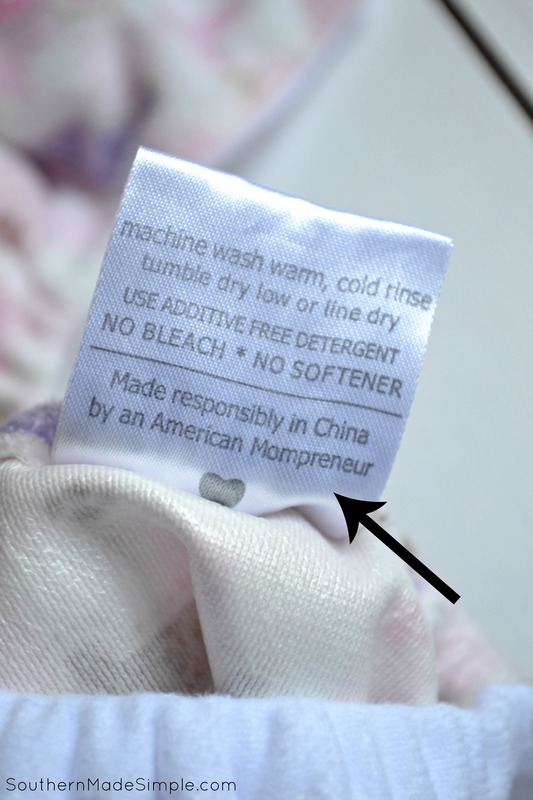 And look at what I found in the tag of this diaper! I just love supporting other working mama’s businesses, and knowing that her diapers are responsibly made makes me feel even more confident about my purchase. The standard pocket diapers (you can choose from prints or solid colors) come with a free microfiber insert pictured below. 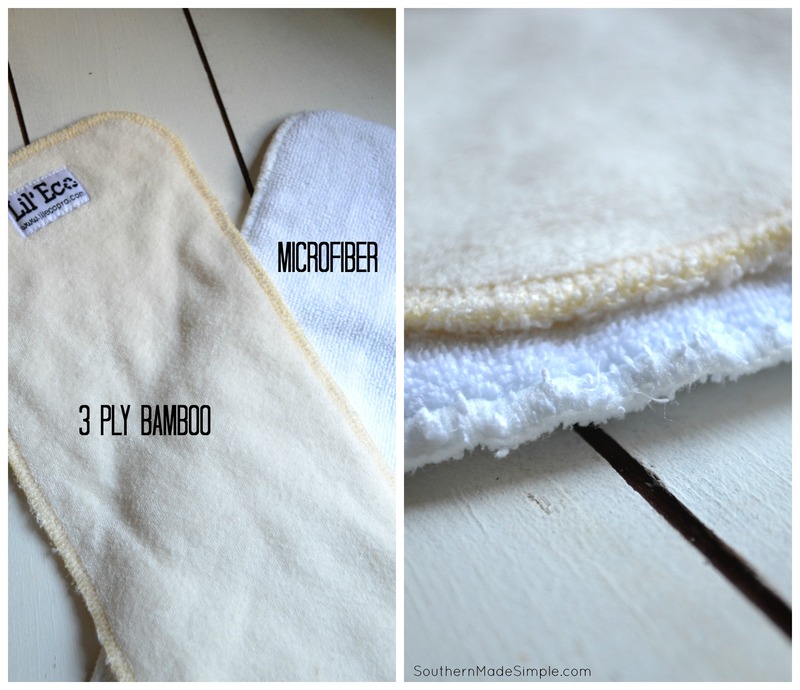 You can also choose to upgrade to a bamboo insert which is more absorbent and more trim than the microfiber. Both of these inserts have been great for us! I recommend ordering an extra insert with each diaper. I personally double stuff all of my pocket diapers for extra absorbency. Unless you’re cloth diapering a newborn, I don’t think just one insert is going to provide the absorbency that you’ll need. Since my original purchase from Lil’ Eco, I’ve had the great fortune to review one of her All In Two diapers that she had in stock. I already loved the pocket diaper I owned, so I was over the moon to try the AI2. 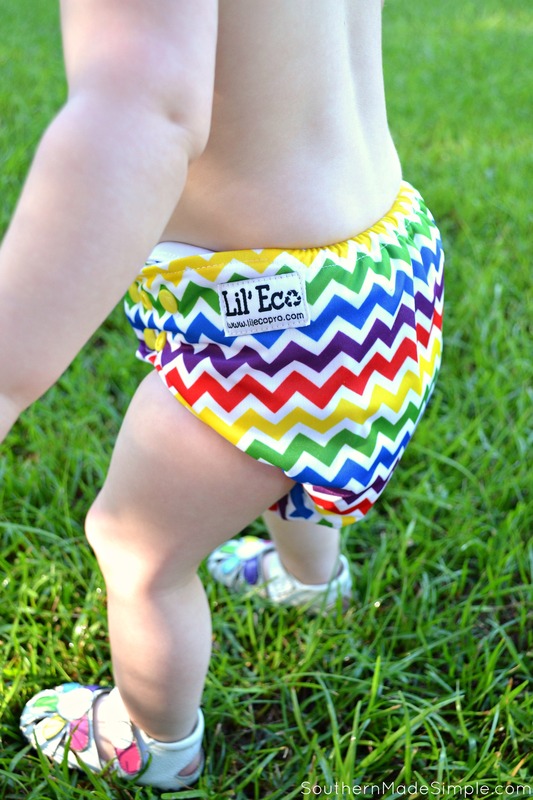 I received the Rainbow Chevron All In Two Cloth Pocket Diaper pictured earlier in this post, and it’s really been an awesome diaper for us! One of the first major differences I noticed between the AI2 and the pocket style diapers was the double gusset feature. If you look at most regular disposable diapers, you’ll notice a double gusset, or a second elastic lining in the diaper designed to help keep everything inside the diaper. 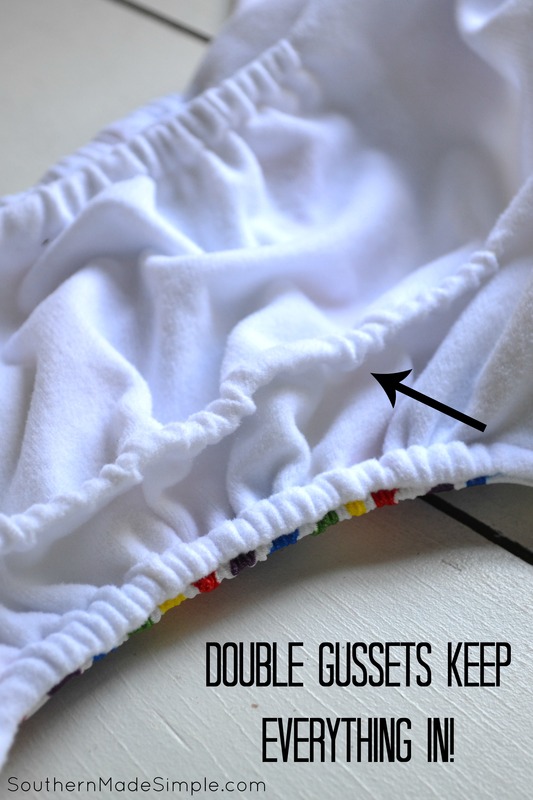 Hear me when I say this, y’all… If you’ve never tried a cloth diaper with double gussets, you don’t know what you’re missing! I feel much more confident that a leak won’t occur if the diaper has that second elastic lining in it. In addition to the double gusset feature, Lil’ Eco’s AI2 diapers have a large pocket opening at both ends of the diaper and a flap in the front to help keep the insert from working it’s way out. I really appreciate the size of the pocket openings. They make for super easy stuffing and removing of the inserts! 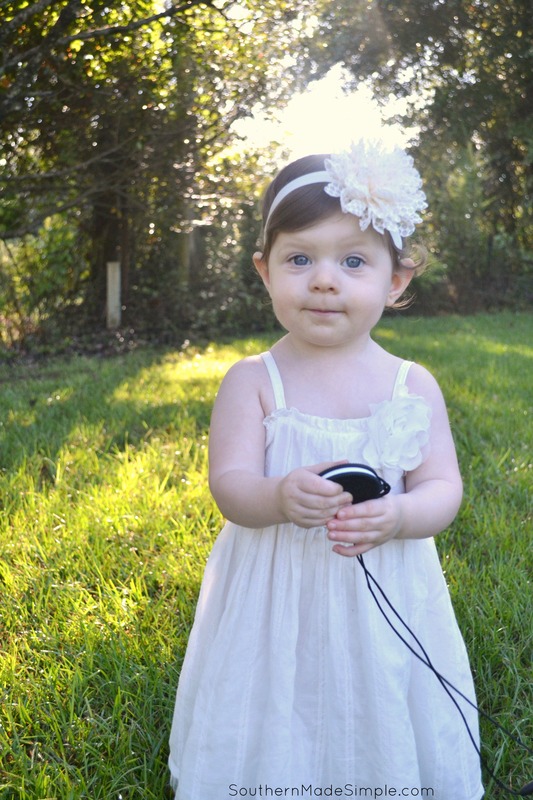 In addition to the amazing selection of diapers, Lil’ Eco has also branched out into offering all sorts of amazing and adorable accessories for littles on Etsy! Check out this beautiful headband they sent our way. Isn’t it just beautiful? There’s even a section of items that are made in Hawaii. I’m totally digging those mermaid tails! And have you ever heard of “Chewelry” before? Lil’ Eco offers a line of high quality food-grade chew teethers that come with a break away necklace so they can be worn safely as a necklace. It’s jewelry babies can chew on! Get it? Chewelry! Hah, I think that name is so clever! If you’re shopping around for cloth diapers and other baby accessories, I highly encourage you to check out Lil’ Eco’s shop! The prices are really hard to beat, and the quality is exceptional. Plus, you’ll be supporting a work at home mom while you shop! OPEN TO RESIDENTS OF THE UNITED STATES 18 AND OLDER. LIMIT ONE ENTRANT PER HOUSEHOLD. GIVEAWAY WILL END AT 11:59PM CST ON 9/06/2016. WINNER WILL BE DRAWN USING GIVEAWAY TOOLS. ENTRIES WILL BE VERIFIED. WINNER WILL BE CONTACTED VIA EMAIL AND WILL HAVE 48 HOURS TO RESPOND BEFORE THE PRIZE IS FORFEITED AND A NEW WINNER IS SELECTED. SOUTHERN MADE SIMPLE IS NOT RESPONSIBLE FOR PRIZE FULFILLMENT. I love the “Baby Grand Piano Cloth Pocket Diaper” and “Island Rainbow Teether and Pacifier Clip.” They are super cute and gender neutral, so we can use it for the next baby too! I like mindful elephant and Picasso foxes diapers. Octopus necklace. I love the kissing elephants diaper! I like the You are my Sunshine diaper with the Oreo teether. The price point for the diapers is BANANAS (in a very good way)! I love the Outer Space Pocket Diaper! I would also have to choose the Dino Chewlry for our little girl who love to ROAR like a dinosaur!!! I love the Eastern Elephant pocket diaper and the dinosaur chew toy. I like the Candy Castle Cloth Pocket Diaper and the Oreo cookie teether. I think I would choose a harry potter diaper and oreo teether! oh my gosh! I LOVE the Mindful Elephant Diaper! SO different and beautiful! I’ve gotta say, the oreo teether is pretty darn fun as well! I like the octopus chew and the “I’ll Whaley love you” diaper. I like the Feathers Cloth Pocket Diaper and the Island Rainbow Teether and Pacifier Clip. Colonal Mustard Cloth Pocket Daiper and the octopus teether! So cute! I’d get the Rainbows and Unicorns cloth diaper and the Rainbow Teether. It would be a perfect set for my friend’s baby girl. I love giving cloth diapers as gifts! I love the Puff the Magic Dragon Cloth Pocket Daiper! As for a tether, I really like the Mr. Fox! I’d pick the Eastern Elephants Cloth Pocket Daiper & Island Rainbow Teether and Pacifier Clip. I love the Captain America diaper and Mr.Fox teether. If lucky enough to win I’d have our daughter and her boyfriend choose their favorite because I’m trying to win this for my 1st grandbaby.. I like the Seahorses All in One (AIO) Cloth Pocket Diapers. Hawaii Honu cloth diaper- look at those sea turtles and octopus teether…then we’d have to take a trip to the beach! I think Colonel Mustard would be my diaper choice… and I really like the wooden teether necklace! I’d pick the butterflies AIO and a cookie teether. Too cute! I love the Smart as a Fox Cloth Pocket Diaper. It’s so cute! And the Mr. Fox Teether would be so great to go with it! What neat pair that would be! The Baby Grand Piano! Love it! And the owl chewlery is absolutely adorable. I would choose the eastern elephants diaper and the Oreo teether. Would love to win for my baby boy! would love the ‘eat local’ diaper for my duaghter we/ll be celebrating our 1 yr nursiversry soon! I love the unicorn/rainbow and mermaid prints which are currently out of stock 🙁 and the octopus teether is adorable! Love the puff the magic dragon print. I love the octopus cloth diaper and the octopus teething necklace they are so cute! I love the tropical flower AIO and octopus teether. 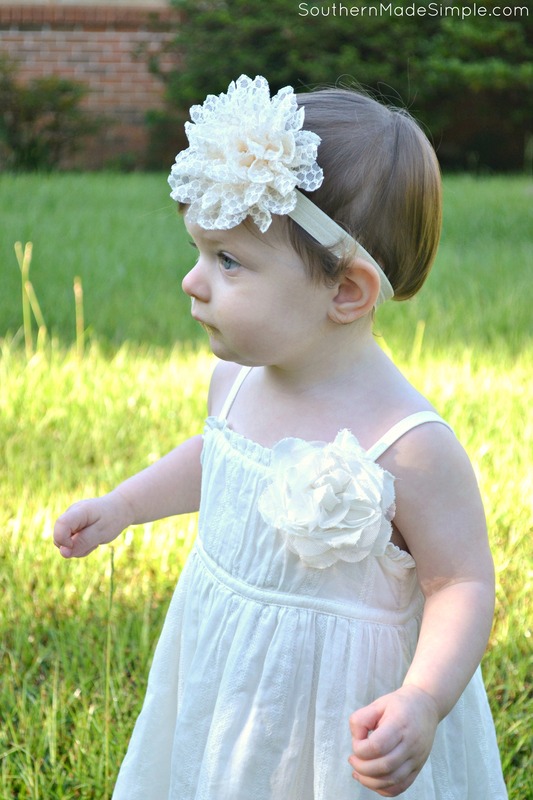 So feminine and cute for baby girl! Love these cloth diapers, so much cuteness to choose from but I would pick the rocket ship for my son! I would choose the Owl Always Love You pocket diaper and teether. They are both so cute and we love owls. I love the sugar skull, Puff the Magic Dragon, and foxes!! For a necklace, the octopus from Hawaii is adorable!! I would like to see the ai1 and ai2 options available but I like the mindful elephant pocket! The Lonley Penguin swim diaper/potty trainer is super cute and so is the octopus teether. I would choose the strawberries cloth diaper and the octopus teether! I’d choose the pink elephants and the owl always love you teethhe! I like the lonely penguin swim diaper, and the octupus teether. I would choose the octopus teether, or the wooden teether in rainbow color! The diaper of choice would be the Colorful Coral swim diaper. I love the eat local diaper and the fox teether. I like the Harry Potter diaper and Oreo teether. I would choose Owl Always Love You diaper and the matching teether. I would choose the Butterflies AIO and Octopus necklace! 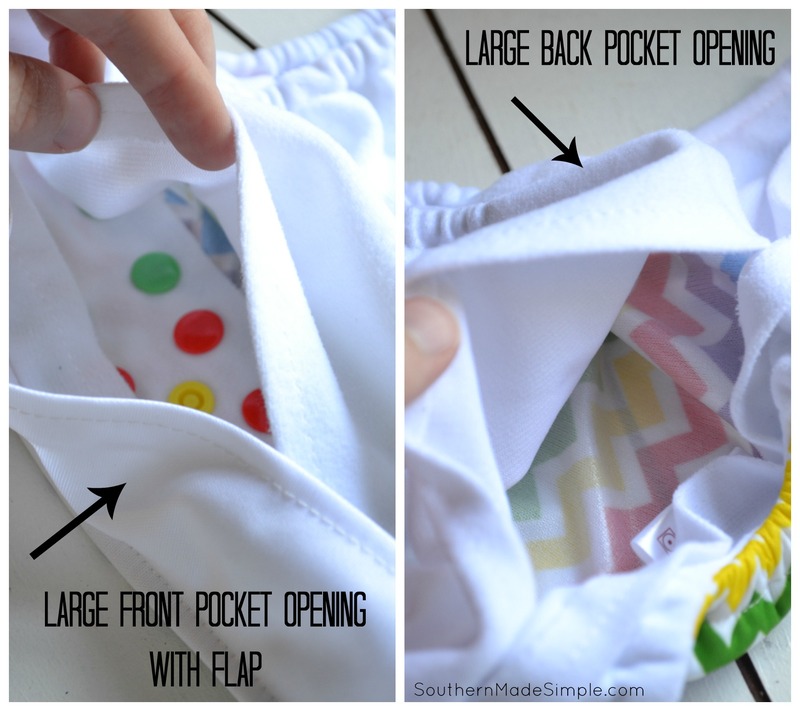 I love the Pochahontas Cloth Pocket Diaper! and the Oreo teether!! I would get the seahorse pocket diaper. So cute! And the octopus teether. I would pick the rainbow butterflies diaper and the oreo teether. I love the Navajo Fox diaper, Duck Hunting, and the Harry Potter Magic diapers. I would be so excited to try either the hunting with daddy print diaper or the pink bubblegum all in two. And the hungry hippo teether is so adorable! I love the Eat /local diaper and Oreo teether. I’d choose the Midnight AI2 and Mr. Fox teether. I love the pocohantus diaper. 🙂 It would be awesome to win. I like the dino teether and the Harry Potter Magic diaper. 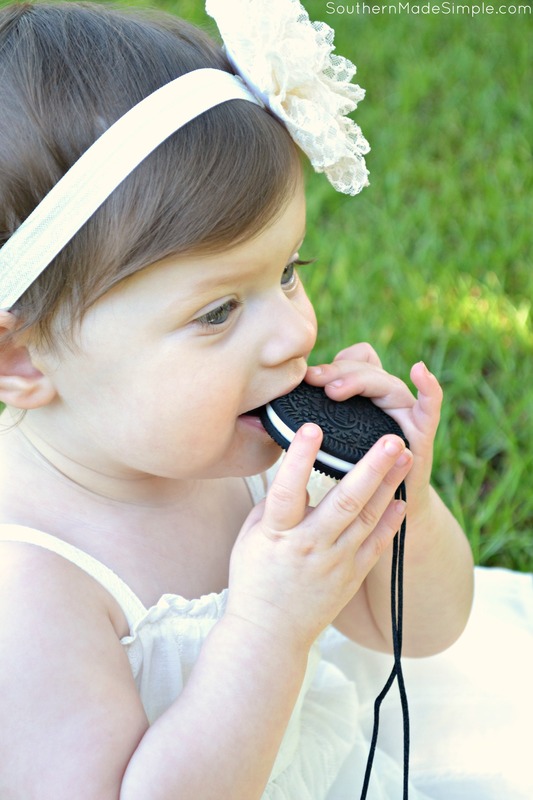 The Oreo teether is just the cutest! And that rainbow diaper, I love! I love the winter foxes print! The baby dinosaur is my favorite teether. Thanks for introducing me to this brand! if i won, i would get the oreo teether and the eastern elephants. Blacklight Fishies Swim Diaper/ Potty Trainer/Cover with Oreo Cookie Foodgrade Teether and Nursing Chewelry. I like the Paisley Princess Swim Diaper/ Potty /Cover, and I like the Oreo Cookie Foodgrade Teether and Nursing Chewelry. The seahorses diaper is my favorite and I love the octopus teether! So cute!! I absolutely adore the Aloha diaper and the oreo cookie teether. I would choose the Aloha Rainbow Cloth Pocket Diaper and the Island Rainbow Teether and Pacifier Clip! Seashores diaper and octopus teether. So cute! I would choose the Hot Air Baloon All in One (AIO) Cloth Pocket Diaper and Octopus teether. The rainbow zoo cloth pocket diaper and the Mr. Fox teether would be my choice! I love using cloth diapers and woud certainly like to give this brand a try! I love the Candy Castle diaper, it is so cute. I also like the octopus teether because all of the decorations I. Our house are ocean themed. I love the Puppy Paws Cloth Pocket Diaper.